When in Rome….Where to Stay? We’re fortunate that we don’t have a tight budget for our Italian adventure, but that doesn’t mean I want to splurge on hotels for no reason. I’ve been particularly surprised by the higher-priced hotels in Rome — yes, there are cheaper options, but I have a specific area in mind and am looking for a certain something in the hotel we choose. 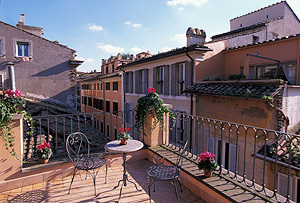 After a bit of research, we found that the Campo de Fiori/Pantheon/Piazza Navona area is the place to stay. While we’ve found some very promising prospects, we have not found anything that makes us say “wow.” Capturing the trade-offs with each option is key, and we will eventually make a decision. Location is the main constraint in the search. Since we plan to be out and about most of the time, I am less concerned with the actual room and amenities than I normally would be for a stay. The nonrefundable rate for the lowest level room (standard double) is just under €100 per night. 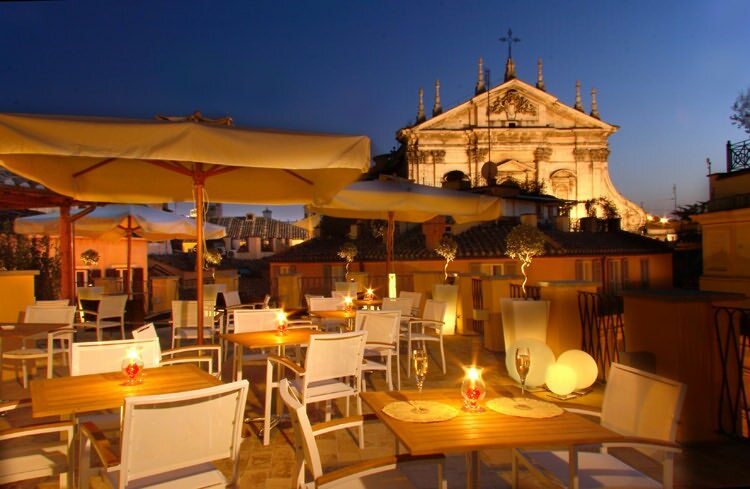 However, we’re looking at either the double room with terrace or junior suite with terrace, since the price is still within our “budget.” The nonrefundable rates for those rooms are €336 and €380, respectively (if we choose the “long stay” discount, it’s €378 and €427). While the rooms aren’t anything special, the location is great: it’s located just steps away from Piazza Navona (where the annual Christmas Market will be set up!). And since it’s not right on the square, we should be able to stay away from the crowds, if we desire. Again with this hotel, the location is a huge plus: it’s located off of Piazza della Rotonda on a less crowded side street. It’s still in our preferred area. The rooms are not upgraded and some of them are described as being “cozy and comfortable,” but the rooftop terrace is a major win. Breakfast is served on the terrace and at 6pm, the bar opens up. The cost is €378/386 total (depending on the type of room – I’m not sure what the difference is, though). There are also more expensive rooms extra room, but that’s not something we need in Rome! So do we choose the hotel with the private terrace, or the one with the shared rooftop terrace (and bar)? And does it matter whether or not we have a terrace if it ends up raining the entire time? I’m still debating whether one location is superior to the other (they are fairly close – only a 9 minute walk, according to Google Maps). We’ll give it another month or so (and keep checking to make sure there’s availability) before booking, and maybe even later if we go with Residenza Canoli and opt for the nonrefundable rate. However, it seems we can’t go wrong with either of these hotels! This entry was posted in Accommodations, Travel Planning and tagged Europe, hotel, Italy, Italy 2013 Trip, Rome by Kristin. Bookmark the permalink.